Our friendly and experienced Springs maintenance teams are accessible 24/7 to deal with those unexpected emergencies that are a part of life. 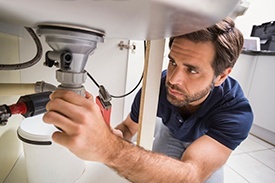 You might be surprised to learn that there are some simple DIY methods to keep appliances and fixtures running smoothly in your Springs luxury apartment home. We've compiled a handy list of tips from maintenance professionals that are easily incorporated into your everyday housekeeping. As the name implies, dishwashers are for dishes only. You may have read great suggestions for poaching salmon, but when you start using your dishwasher for other purposes, it's a likely recipe for trouble. Not all cooking and eating implements belong in a dishwasher either. For instance, did you know that labels from glass jars can flake off and clog the filter? Run your dishwasher once a month to prevent odors and keep parts from drying out. If it does get a bit smelly, use citrus fruits to clean and deodorize the blades and containers. Be sure to use soap formulated specifically for dishwashers, not regular dish soap. Prevent unpleasant surprises by giving the heat and A/C trial runs before you actually need them. Don't shut the heat and A/C down completely when you're out. Keeping temperatures at a moderate level is more energy-efficient than running systems at full blast from zero. If you break #7, look for the reset button on the bottom of the disposal. Kitty litter goes in the trash, NOT the toilet. In fact, toilets should not be used to discard anything other than what they were intended for. Commercial drain cleaners are expensive and laden with harsh chemicals. Keep your drains running free with an eco-friendly solution made from one cup of baking soda, one cup of salt and one-quarter cup of cream of tartar. Store the mixture in an airtight container and pour one-half cup down the drain once a month or so. Follow up with a rinse of boiling water. Are hair spray cans or other toiletry containers leaving rust rings? Create a eco-friendly stain remover by sprinkling salt on the cut part of a lemon half and rub it on the stain. Don't fret if a maintenance job seems too big to tackle on your own. In fact, we’d prefer you give us a call rather than attempting mechanical fixes on your own. Our on-site management teams and professional maintenance staffs are always ready to help. Call, stop by the office or submit a request via our Resident Services link.